The Amver participating container ship Joanna saved 105 migrants off the coast of Libya on February 18, 2017. The crew of the Joanna was sailing west of Crete on a voyage to Italy when the ship was notified by rescue authorities in Malta of a possible migrant or fishing vessel in distress. The crew of the Joanna located the wooden boat which was holed and taking on water. On the boat were 105 African migrants including three pregnant women and a number of children. 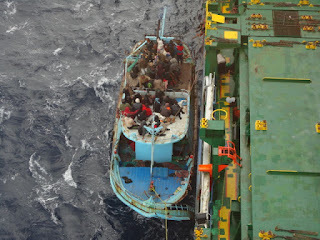 Despite choppy seas and high winds the crew of the Joanna were able to secure it along side the 600-foot container ship. "Following the rescue of the migrants, we placed the pregnant women and children in ships accommodations while sheltering the remainder of the survivors on the deck protected by the containers. 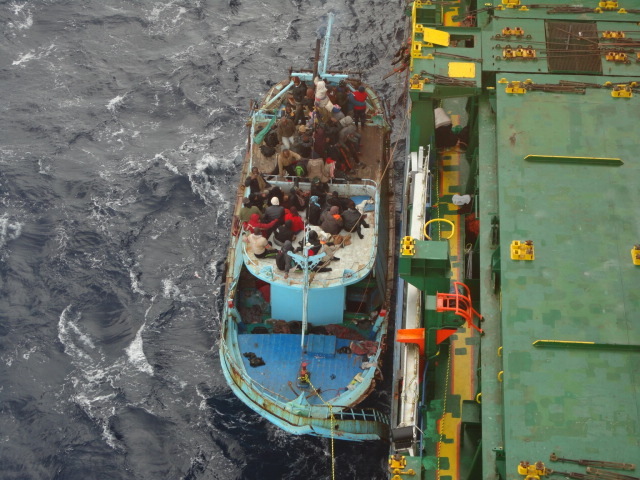 We provided medical attention to the ill, food and blankets and notified FRONTEX of the rescue," reported the ship's captain to the Amver center. The Joanna safely transferred the 105 survivors to Italian authorities the following day. The Joanna, managed by Eurobulk of Greece, enrolled in Amver on November 2, 2001. Another week, another opportunity to share just who joined Amver. Listing the ships enrolled in Amver goes back to the very beginning of the Amver program. The original Amver bulletin included a list and call sign of the new ships enrolled in the program. We are pleased to continue that tradition here on our blog. If you haven't joined yet, please consider becoming a part of Amver and ensuring no call for help goes unanswered.